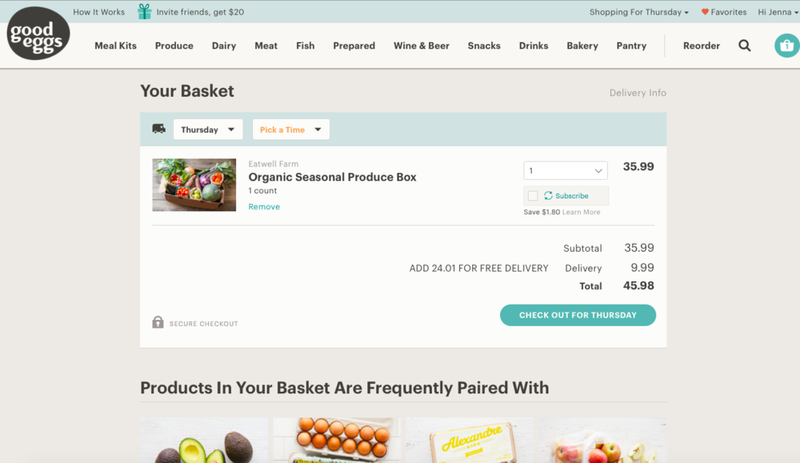 I have been on a quest to find the perfect produce box delivery service in the Bay Area. I have subscribed to one company each week over the course of the past 10 weeks. I began compiling my notes, sifting through all of my likes and dislikes between the different services, and threading together industry commonalities to help me decide the absolute best in the business! But for now, I had just one more company to try out before providing my ranking, so I decided to go with a service that was a bit different than many of the others I had tried. Good Eggs is an online grocery and meal kit delivery service that provides fresh, local, and sustainable food with same-day home drop off throughout the Bay Area. The privately owned company was founded in 2011 as an alternative to the old grocery store model. They work with strict sourcing standards and boast that over 70% of their inventory is local. Good Eggs takes all of the guessing that a consumer may be faced with when deciding if a product is healthy or unhealthy because they have curated their store with trustworthy brands, whole food products, and healthy ingredients. Good Eggs is a one stop shop for local groceries, selling everything from produce, dairy, animal proteins, beverages, snacks, flowers, and prepared meals. They also work with three farms (Full Belly, Say Hay and Eatwell), selling their produce boxes. 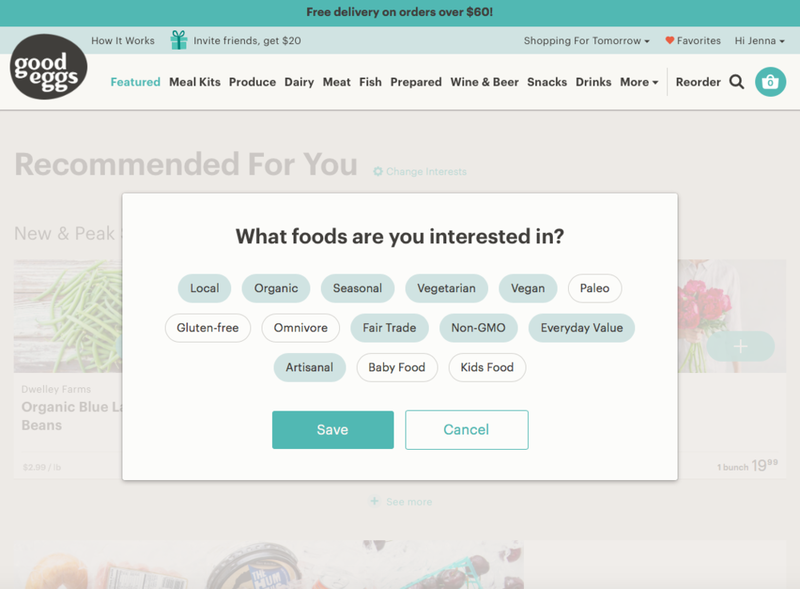 Upon arriving on the Good Eggs website I had the opportunity to select my specific food interests so that the company could personalize recommendations based on my preferences. There are a lot, and I mean a lot, of options to sift through on the website. All of the products are organized quite efficiently into a variety of categories. The interface itself is easy to navigate. If you are using it for your grocery shopping, make sure to leave yourself ample time as it is easy to get swayed into looking at more and more unique and local products and brands. The meal kits are equally interesting and priced reasonably well, for example baked salmon and baby broccoli to serve 3 people is priced at $24.99. Tucked inside of the produce tab resides ‘produce boxes & bulk’ where I found the list of the CSA boxes that Good Eggs carried. Be sure to also check out their ‘cosmetically challenged’ and ‘bulk produce’ categories, for there are some excellent produce deals. Although I had already ordered all three of the offered produce boxes in weeks prior, I wanted to test out the delivery service of Good Eggs. So, after a quick sign up, that is exactly what I did. I chose Eatwell Farm’s organic seasonal produce box for my Good Eggs review. When I ordered Eatwell Farm’s produce box directly from their website a few weeks back, I had to commit to 4 deliveries, but on the Good Eggs platform I was able to choose a one time commitment, costing me $35.99 plus $9.99 in delivery. There is free delivery available, but only on orders that hit the $60 mark. Good Eggs offered two different days for delivery of the Eatwell Farm CSA: Thursday and Saturday. I placed my order for the produce box one day prior to the Thursday delivery. I did not have to worry about recurring orders or anything like that which was helpful for me. No customization option for the CSAs in particular, however there are a ton of customization options available for any Good Eggs order. As stated before, Good Eggs is the mecca for online food shopping when it comes to local produce and trustworthy brands in the Bay Area. Good Eggs delivers to homes throughout the Bay Area with a $30 minimum order. There is a $60 minimum in order to qualify for free delivery. Otherwise you will be slapped with a $9.99 charge that will be added to the order. The company dropped off a large box of produce to fulfill my Good Eggs review order. There was a newsletter included in the box, similar to the one I had seen before (link to EatWell review here) that listed all of the contents packed inside, along with a story about this week’s collection of produce and a few featured recipes to peruse. The items I received this week were plentiful. They truly displayed their fullest expressions and I just knew they would be loaded with flavor and nutrients. I absolutely loved the value with Eatwell’s produce box, which is even $4 cheaper if you order it directly from the farm however they do lock you in for a four week minimum commitment. Turnips: I knew from the past that I’d separate the leaves from the root and store them separately to prolong their shelf life. Chives: For a little extra garlicky flavor, these herbs will be a nice addition to salads, quinoa bowls, tofu, and more. Parsley: I love this herb and I cannot wait to throw it on to many future meals and snacks to brighten up the taste. Basil: A huge amount of fragrant herbs, probably 5 handfuls in total! Collard Greens: A dense bunch of dark green leaves. Cabbage: One small head that resembled a cone shape! New Potatoes: Their thin skins were noticeable, as they were already peeling back from the potato, disclosing their insides. Broccoli: A few small heads that possessed unique shades of green. Green Garlic: A healthy bunch that contained pungent cloves of garlic. Rainbow Chard: Large, green leaves sitting on top of sturdy stalks in a variety of colors that resembled a part of the rainbow! Red Leaf Lettuce: A beautiful bunch of deep red leaves. Tart Cherries: A pint of small, red, seasonal beauties that I knew would be bursting with a tart sweetness that only a cherry can contain. Slowly but surely, I have been incorporating my learned produce storage tips. This week, I tore off the leaves from the turnips, wrapped the turnip greens in a damp paper towel, and stored them separate from the root. I wrapped the rainbow chard stems in a damp paper towel as well. For the collards, I surrounded their stems in plastic wrap. For the basil, I removed from the plastic covering they were delivered in and stood the herbs up in a bowl filled with water. I unwrapped the chives and parsley and stood those herbs upright in a mason jar filled with a little bit of water. These fresh herbs were so fantastic to have on hand for multiple meals and snacks throughout the week! I cooked down a variety of vegetables to create this soup, including both the potatoes and the broccoli that were part of my EatWell Farm review box. Once the vegetables were cooked down a bit with the broth, I added over 1/2 cup of the aromatic basil leaves, barely making a dent in the bunch! I then blended the chunky soup in batches until it was pureed. This soup was served with a garnish of fresh basil leaves before it was consumed - bowl licked clean! 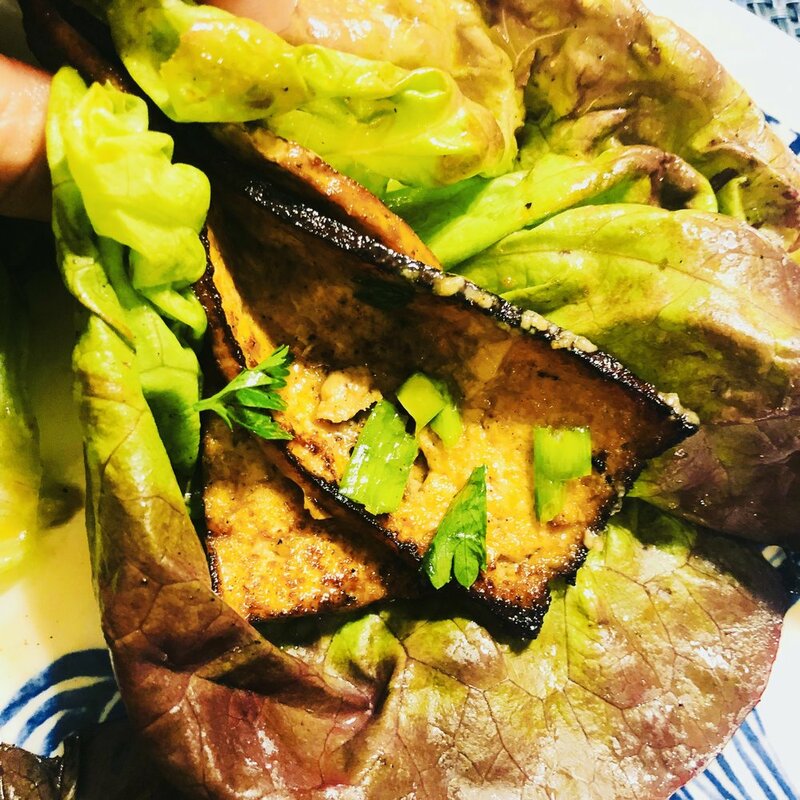 The meal was nutrient dense, creamy, and 100% vegan! I love cherry season and I am thrilled that there is another month or so to enjoy these fresh from the farm beauties. I decided to play around with a few and created a healthy dessert. I melted down some coconut butter and oil until it reached the creamy consistency I desired. I then dipped my cherries, one by one, into the butter and oil mixture. Once the excess dripped off of the outside of the fruit, I placed each covered cherry onto a baking tray and popped it into the freezer for just a few minutes to harden. I repeated this process once more time through to get a nice coconut coating on my fruit. I enjoyed these throughout the next few days. They were a great snack! I love treating my red leaf lettuce as wraps because it gives me the sensation of biting in to a sandwich. This time I paired my lettuce with a tofu ‘bacon’. To prepare the bacon, I began by wrapping my tofu block in a paper towel. I pressed out as much of the water as possible by weighing it down with the back of a pan. I then marinated the tofu in a soy sauce, oil, honey mixture, and then fried the slices in a pan. I laid a few bacon slices on top of my lettuce leaves, sprinkled them with a hefty amount of chives and parsley, and chomped on a few for lunch. I loved having fresh herbs in the fridge this week. They really brightened up the taste of many meals. I was impressed with the Good Eggs shopping experience. The platform was a great one-stop shopping site where I felt that the company kept the interest of my health at heart. As long as I could hit the $60 mark, I would not have to endure the $9.99 delivery fee. There were three wonderful CSAs offered on the Good Eggs site, with multiple delivery dates for both. This made ordering and receiving a CSA box quite simple. Plus, I did not have to subscribe to multiple boxes at once, as I had to with these specific companies when I ordered direct from their websites. The process was simple, it was delivered straight to my door, and all items were fresh. As long as the customer is looking to do some extra grocery shopping when they visit the Good Eggs platform, this method of ordering a CSA box makes a lot of sense.